What goes into every bowl? A straightforward approach to everything we do. A little bit of extra love and care in every recipe created. Perfectly mixed small batches of just what you want ...and nothing dodgy. Grown all around the world for centuries, buckwheat is not actually a cereal, though it can be used in much the same way as wheat or barley. 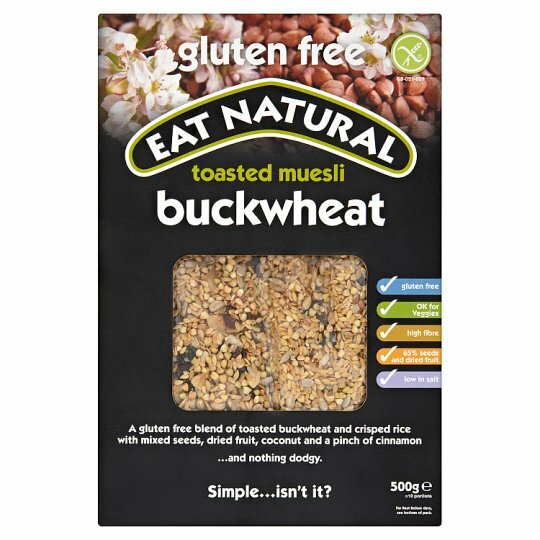 The great thing is though, buckwheat is totally gluten free. Our special toasted blend of delicious mixed seeds makes up nearly a third of this recipe. We use nutty sunflower seeds, crunchy pumpkin seeds and golden linseeds. We're ever so proud of our wonderfully plump and extremely juicy jumbo raisins and sultanas. Our raisins are made by sun-drying the deliciously sweet 'Flame' variety of red grapes, from Chile. Down here at the Eat Natural Makery, when we say 'natural', what exactly do we mean? Well, clearly it would be wrong of us to claim that everything in this muesli is '100% natural' - rapeseed oil and crisped rice simply don't grow on trees. Obviously, everything needs to be cleaned, dried and roasted too, and therefore, to some extent, 'processed'. It's just that we believe, the less we mess with it... the better it tastes, and why we will never, ever add any dodgy stuff. That means, no artificial flavours or colours and no preservatives. Store in a cool dry place, For Best Before date, see bottom of pack.